The space shuttle Discoveryâ€™s repaired external fuel tank is hoisted into position to meet its twin solid rocket boosters in preparation for NASAâ€™s STS-120 construction mission to the International Space Station (ISS). 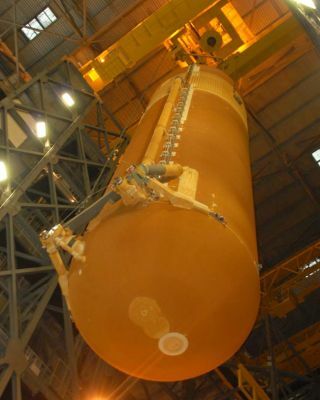 NASA engineers attached thespace shuttle Discovery's external fuel tank to its twin rocket boostersWednesday following a week of repairs to avoid the same type of foam debristhat dinged the Endeavour orbiter during liftoff earlier this month. Shuttle workers are now readyingDiscovery to move into NASA's Vehicle Assembly Building at the Kennedy SpaceCenter (KSC) in Florida in preparation for its planned Oct. 23 launch towardthe International Space Station (ISS). Engineers spent just over aweek prying loose crackedlayers of cork insulation from a series of large brackets on Discovery'sexternal tank. "There were not anysurprises and we found what we were looking to find," KSC spokespersonGeorge Diller told SPACE.com, adding that Discovery is due to roll overto the 52-story Vehicle Assembly Building to be attached to its fuel tank onSept. 19. The cracks were firstdiscovered in an X-ray survey of the tank after a piece of debris popped freefrom a similar bracket during the Aug. 8launch of Discovery's sister ship Endeavour. That debris ricocheted off ametal strut and carveda small gouge in Endeavour's tile-covered underbelly. While the damage toEndeavour posed no risk to the orbiter or the safe return of its astronautcrew, NASA scrutinized its next three shuttle fuel tanks to fly to avoidsimilar debris- shedding events in the future. Thespace agency has worked to limit the amount of debris shed during shuttlelaunches, while keeping a close watch on the integrity of orbiter heat shields,ever since the 2003 loss of theColumbia spacecraft and its astronaut crew. During X-ray scans of Discovery'sfuel tank, engineers found cracks in a composite material of cork and siliconeknown as super-lightweight ablator (SLA), which sits sandwiched between thesurface of an aluminum bracket and its outer layer of foam insulation. Thebracket is one of a series that secure a liquid oxygen feed line to the fueltank's outer hull. The cracks may allow theformation of ice when the fuel tank is pumped full of its super-chilled liquidoxygen and liquid hydrogen propellant. The result could lead to the same typeof debris shedding as that which dinged Endeavour last month, NASA has said. Since both the ablatormaterial and ice are denser than the lighter outer foam layer, they can causemore damage to an orbiter's heat shield than foam alone, shuttle officials havesaid. Engineers removed the ablator layers from four of five brackets with thecracks on Discovery's fuel tank and plan future repairs for the next two tanks thatwill support shuttle flights in December and February. NASA is developing apermanent solution, which will replace the aluminum brackets with new titaniumones, that will debut on a planned April 2008 shuttle flight. Commanded by veteranshuttle flyer Pam Melroy, Discovery's STS-120 construction mission will deliverthe newHarmonyconnecting node to the ISS, where it will serve as a foundation for thefuture addition of international laboratories. Once attached to its fuel tankand rocket boosters, Discovery will roll out to its KSC launch pad in lateSeptember, Diller said.